STORE YOUR STUFF:The 2 handy zipper bag and mesh bag on the treat bag for your stuff.Keep your smartphone,earphone,keys,money or snacks safe and bag is convenient to take.Complete with an adjustable long strap belt, plus a sturdy belt clip, the dog walking bag can be worn around the waist or over the shoulder,come with a dry bag sack,more room to store your things. GUARANTEE - 100% guarantee refund policy if low quality or broken ,even used.It's a unbreakable durable lightweight dog dual compartments useful travel bag. A dog training pouch is a dog owner’s reliable ally during training. It’s built to hold your canine’s favorite snacks, treats, and toys. Also, it can accommodate clickers, collapsible bowls, and a wide range of other accessories. A good dog training pouch should also be spacious enough to hold the owner’s essentials, such as car keys, money, tissues, and cellphone. It has to be sturdy and comfortable to wear for prolonged periods of time. Weatherproof construction and low maintenance are also among the desirable features. The Hero is an affordable and versatile treat pouch. It has a modern design, waterproof construction, and a neat set of accessories comparable with pricier models. This pouch offers more than enough room for treats, your dog’s favorite toys, and your accessories. This treat bag is intended for all dogs ranging from small to large sizes. For toy breeds such as Chihuahua and Mini Yorkie, you’d be better off with a smaller pouch. On the other hand, if you own an extra-large dog (Mastiff, Great Dane, etc. ), a bigger pouch might be in order. Aside from the particular breeds and sizes, this pouch is made for dog owners who want a reliable and spacious treat pouch on a budget. The Hero Dog Training Pouch bag comes with a range of useful accessories and extras. The package features an adjustable waistband and shoulder strap to accommodate different carrying styles. Also, the box includes one waste bag with a cute doggy bone print pattern. Finally, you will also get a collapsible bowl with this pouch. The bowl is made of high-grade, BPA-free silicone and sports the brand’s characteristic orange-black color pattern. The bottom of the bowl features a silhouette of a sitting dog. It can be attached to the pouch via the built-in carabineer clip. 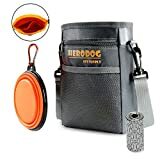 Overall, the Hero Dog Training Pouch Bag is medium to large, and features a sturdy build, modern design, and excellent functionality. The pouch has a divided main compartment, front pocket, back pocket, and front mesh pocket. It also rocks a pair of D-rings on the sides, as well as a belt clip in the back. The back of the pouch is equipped with a handy poop bag dispenser. Standing up, the pouch is 5.1” long, 7.8” tall, and 2.3” wide/deep. The main compartment is large enough to hold up to four 4” toys. It can also hold more than enough treats for long training and walking sessions. Thanks to the dual-compartment construction, you can carry both your dog’s treats and kibbles in it. The interior is furnished with a fluorescent orange lining of the same sturdy nylon as the exterior. The lining is waterproof to keep the treats dry and can be quickly closed with a drawstring. The lining can also be pulled out for easier cleaning. To the front side of the pouch can be found one of the two zippered pockets. The pocket is big enough to fit a smartphone. In front of it, there’s a grey mesh bag for super quick access to a clicker and other small items. The Hero Dog logo is printed in orange above the mesh. On the back side, the pouch is equipped with a zippered poop bag storage. A silicone insert near the bottom of the pocket lets you easily pull a bag out when you need it. The back side also sports belt clip and a pair of belt rings. The sides feature one D-ring each. The included waistband is adjustable and made of sturdy gray nylon. If you decide to wear your Hero Dog pouch around the waist, the band goes through the ring loops in the back. The shoulder strap features plastic clips on each end and attaches to the D-rings on the sides. Finally, if you want to wear the pouch on the belt, use the metal clip in the back. In order to get the most out of your Hero Dog pouch, you can combine it with a clicker or other proven training methods. For clicker training to be successful, you will need to have plenty of treats stashed in your pouch. First, you should introduce the clicking sound to your pooch in a calm, quiet environment. Click and wait for them to turn towards you. When they turn, take a treat out of the bag and reward your dog. Once your pup becomes accustomed to the sound of the clicker, you can start using it in noisier areas and areas with more distractions, such as other dogs, toys, and people. Again, reward each desirable action with a treat from your pouch. After that, you can start training your dog to perform basic tasks by using the clicker to signal that it’s performed well and a treat is on the way. After the basics, you can move on to more complex tasks and tricks. The Hero Dog is a versatile and affordable pouch that’s great for small to large breeds. However, if you’re looking for a better-equipped package, then you might be interested in the Perrama Dog Treat Bag. This pouch comes with a sizeable treat compartment, plenty of space for accessories, and a handy poop bag dispenser. The included accessories are a 350ml collapsible bowl and a clicker. If, on the other hand, you need a simpler and more basic package, the Paw Lifestyles Dog Treat Training Pouch might be the right solution for you and your canine. The pouch features a large treat compartment, two zippered pockets, front mesh netting, and a handy poop bag dispenser in the back. Similar to the Perrama and Hero Dog models, it can be worn around the waist, around the shoulder, or on the belt. The Hero Dog Training Pouch Bag is an excellent investment for your four-legged pet. It offers a lot of room for treats and kibbles, sturdy and lightweight construction, ample space for accessories, and a poop bag dispenser. A collapsible silicone bowl rounds off this great package.